You would think that after ten years of being married to a Frenchman that not a lot would surprise me about the French. After all, I lived in Paris myself for five years before I met said husband, and had the French thing down. I could do artfully tousled hair with the best of them, I had exact change in my pocket for the finicky baker, and having mastered the French art of neckwear tying, I could turn even an Afghan blanket into a scarf. But this summer, after eight years in America, we’re spending two months at my mother-in-law’s in Brittany and our sojourn is proving that no matter how much time I spend among them, I will always be mystified and enraged and totally enamored of the French. Then let’s move on to drying towels. No one in all of Western Europe has a drying machine so you can just forget about that. The French believe that towels are best dried flat. I, not being of this persuasion, fold mine over an outdoor chair when I come back from the beach and without fail, once I’m inside the house, my mother-in-law will go outside and reposition my towel on the grass. It’s true that beach towels seem to dry better this way, but it’s also true that they’re exposed to topsoil and ants. Whatever. Not my house. I’ve gotten ahead of myself with all the beach going, because if we’re going to start at the beginning of a French summer vacation, we have to start with the good morning kiss. In France, it’s not enough to come downstairs and fight past one’s grogginess to churn out a sincere “good morning.” No, you need to get right in there, despite unwashed face and teeth, and give everyone a smooch. Which is—don’t get me wrong, I’m all for post meridian displays of affection—just too a.m. for me. Once you’ve gotten the morning kiss on, you have to drink out of a bowl. It doesn’t matter if you’re little, like my daughter, and your age is expressed in months, or if you’re my mother-in-law, and your age is secret, when you come to the French breakfast table, your beverage is bowl bound. I’ve often wondered if this is the French’s way of keeping people at the table. After all, it’s pretty hard to commute anywhere with your coffee in a dish. Have you read Pamela Druckerman’s “Bringing up Bébé”, specifically the bits about “Le Cadre?” Well, the cadre is no freaking joke. We have breakfast, lunch and dinner at the exact same hour here every single day, and we all sit down and eat these meals together, and although I respect and understand that this is civilized and a great example for my young daughter, I kind of miss my barbaric American vacations of yore where you’re left to fend for yourself until dinner, which means you hope you get to that last packet of turkey cutlets and Monterey Jack before your housemates do. It would be remiss of me to close without mentioning the French’s obsession with “the four o’clock”, the “goûter”, the nationally recognized hour of the snack. Once our kid got teeth, I started putting together the kinds of things I feel like eating at four o’clock myself, namely, olives, hummus, pistachios, maybe a dry Chablis? And my husband went ballistic. Ballistic, really, not even about the wine! He said, and I’m translating from the French here, “Snacktime is sacred. Snacktime is sweet.” Since then, he’s tried to turn Gabriela onto these chocolate granola biscuits for her four o’clock goûter, and she’s like, Papa, puh-lease. She likes pistachios and olives. I have no way of knowing yet whether she’ll dry her beach towel vertically or horizontally when she’s older, but the salty snack preference is her way of asserting herself in our bicultural family, and it’s an awfully sweet start. Courtney Maum is the author of the debut novel “I Am Having So Much Fun Here Without You,” (now out in paperback from Touchstone/Simon & Schuster), a contributor to the New York Times bestselling essay collection, “Worn Stories,” and the book reviewer for Electric Literature’s satirical “Celebrity Book Review.” Follow her on Twitter @cmaum. Glom on to Courtney Maum! Courtney Maum is a writer. (Insert self-effacing disclaimer), (insert humblebrag). (Insert weird, quirky, twee factoid about me.) 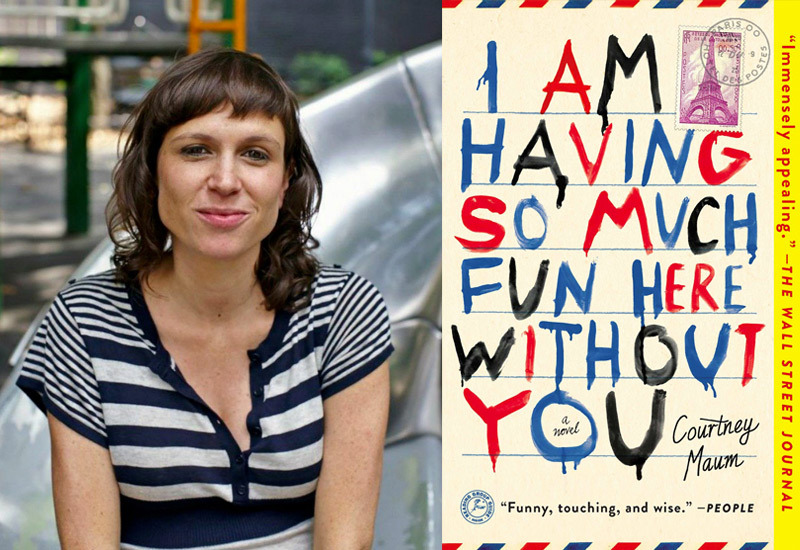 Her debut novel, I Am Having So Much Fun Here Without You, is available now from Touchstone. Awww yeah.